This week seems to have seen the start of various things. The weather remains cool and really dry, a couple of days with rain but, in general the surface of the allotment is hard and crusty. Whilst many people around seem to water continuously, I’m not sure that I want to do that, particularly as there is no “natural” water source at the allotment and its all drinking water quality. Anyway, that’s my choice and if it reduces my crops, its my own fault. So what did I get this week. The strawberries have peaked and we’ve picked about 24lbs from the two beds (each bed is about 20ft by 6ft and the allotment has 11 of them). There’s a mix of different varieties and my hope is that some of them will crop later to extend the season a bit. They’ve been eaten fresh, frozen and dehydrated for storage. 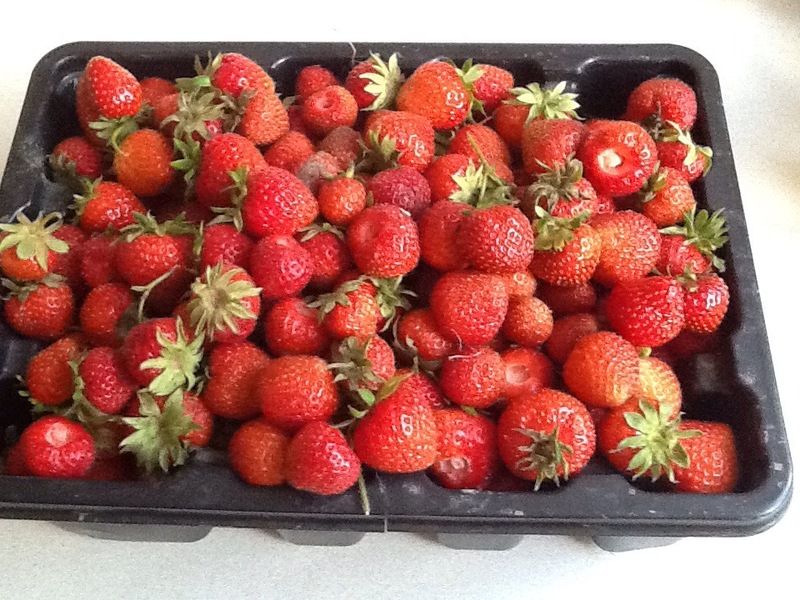 One problem we seem to have this year is that lack of rain means that the strawberries are a bit drier than past years but that’s the way it goes. The redcurrants are producing well. They’re fiddly to pick and we’ve still got redcurrants from last year in the freezer because we don’t really know what to do with them. I have a small handful every morning with my cereal but turning into jelly is probably the best thing to do. The peas are starting, we had a couple of handfuls of mangetout and the early onward are starting to fill out. Our plan is to grow enough peas to freeze some this year, something we’ve never managed before. The spinach has given us a couple of meals and the broadbeans are also still fresh and small (despite the fact that the plants are smothered in blackfly) hopefully we’ll continue to get some for a while. We like broadbeans whilst they are small (not much bigger than peas) and never freeze them because they go tough and tasteless. The success for the week has been the garlic. I’ve been keeping a close eye on it because we get white rot and leek moth so they can easily turn bad. 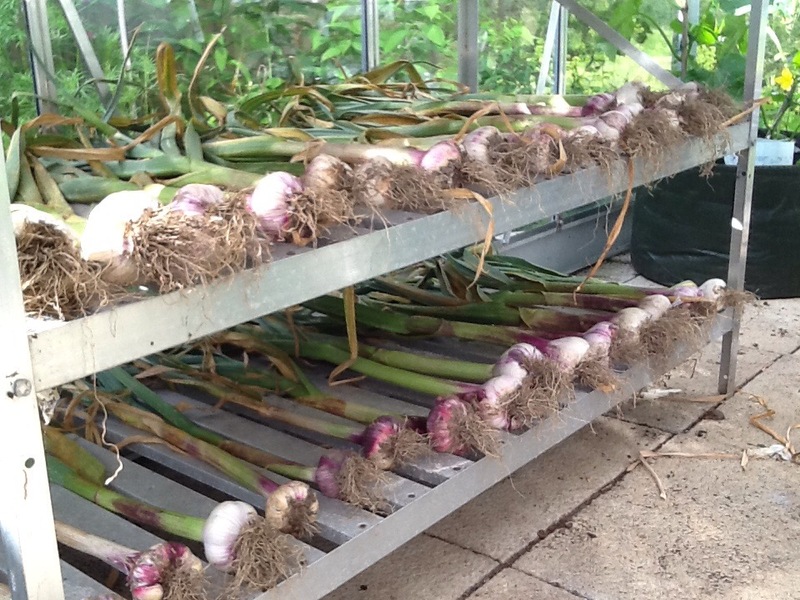 I picked one variety a couple of weeks ago and they’ve been drying in the greenhouse but this week, I noticed that the leaves on the garlic were going off so I picked them and got another 31 large bulbs. 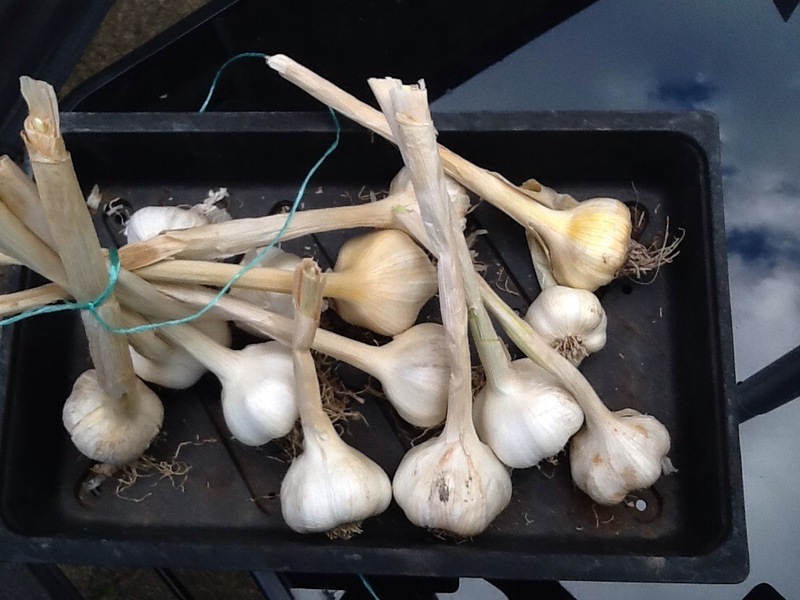 My neighbour at the allotment said that he’d had to throw his away as he had left it days too long and the whiterot had destroyed the bulbs. Anyway, they look fine as you can tell. So that’s about it. We’re also picking sweetpeas for the house and future use and I expect that next week we will continue to get a few more strawberries and hopefully the raspberries will begin to come through in volume. Growing tomatoes and other vegetables in a greenhouse and at an allotment. This entry was posted in Allotment, Allotment Blog, Garden, Raspberry, Strawberry, peas, spinach, Vegetables and tagged broadbeans, garlic, peas, raspberries, Spinach, strawberries. Bookmark the permalink.